Lentils are my favorite bean. I love lentil soup, lentil salad, and even lentils as a side. This week’s recipe for French Fridays with Dorie is “a basic recipe” for French lentils, which I made as a side. Dorie suggests using French Le Puy lentils instead of the brown lentils you usually see at the grocery store. I know that some Doristas had trouble sourcing these, but fortunately, my local Whole Foods always has these in the bulk section where I buy them by the pounds. I love them, particularly in lentil salad, because they hold their shape instead of getting mushy. I agree that they are worth seeking out. This recipe’s preparation is similar to my usual method, but also a little bit different. I’m always up for trying new ways of doing things before deciding whether to adopt some or all of the experiment for a new and enhanced “usual” method. For this version, first the lentils are boiled for two minutes, then drained before continuing. This is to give the lentils a cleaner flavor. I’m not sure I could tell the difference, but I might try it again. 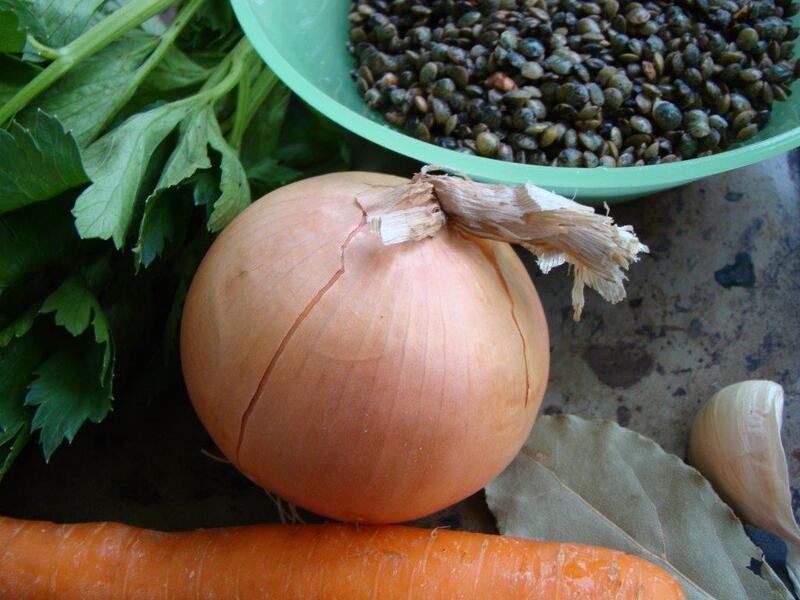 The lentils are simmered with an onion studded with a clove, a carrot, a celery stalk, a smashed garlic clove, and a bay leaf. Once they are tender, some brandy is stirred in for just a minute, before draining the lentils again. My question about this step is: what’s the point of the brandy? I didn’t notice any residual taste. Even though I didn’t use fancy brandy, just Christian Brothers, it still seemed like a waste of brandy. At this point, cook’s choice: discard the vegetables or chop them up. I chopped them up, mixed them into the lentils, and adjusted the seasoning. 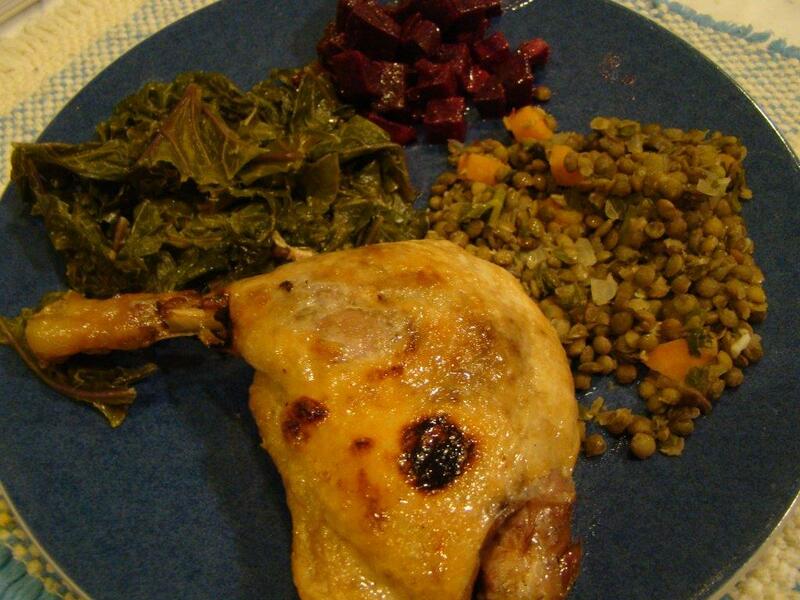 The lentils made the perfect accompaniment to duck confit, beet salad, and braised kale. This dish, or maybe it was the whole meal, felt like a baby step towards welcoming the crispness in the air as summer comes to an end and autumn is upon us. As far as adjustments to my favorite method, I would try the initial quick boil and drain step again before making a final judgment on that step. I usually simmer my lentils with chopped onion and carrots (and a bay leaf). I found the chopping of the warm (well, hot, I was impatient) vegetables fussy, though I did enjoy the flavors, so I might start adding chopped celery and garlic to the mix. but not whole vegetables. Also, no brandy unless I just stirred it into the warm lentils. So, mixed results on takeaways for me. To see how the lentils came out for the other Doristas, check out their links here. We don’t post the recipes, but you can find it in Dorie Greenspan’s book Around My French Table. 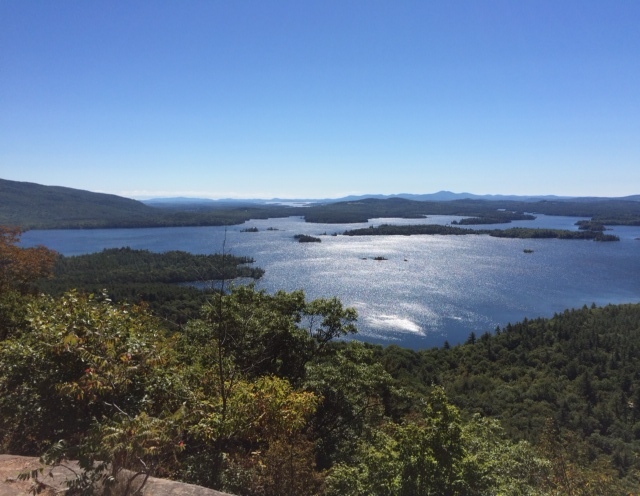 I was at Squam Lake in New Hampshire overnight with a couple of my morning boot camp buddies. This morning, we hiked to the top of Rattlesnake Mountain, and this is the view back over the lake. Gorgeous, no? Posted on 12 September 2014, in Autumn, French Fridays with Dorie and tagged French Fridays with Dorie, lentils. Bookmark the permalink. 15 Comments. Wow, the lake is gorgeous!!! And you’re right; I don’t think I noticed the taste of cognac at all. But with alcohol being a flavor enhancer, maybe it gave lentils a subtle boost. My palate may not be refined enough to discern it, though! Your early AM picture is gorgeous. What is early morning boot camp? ( It sounds hard. ) I also bought my special puy lentils at Whole Foods. Since they carry them in bulk and I only made a 1/2 recipe, it wasn’t too pricey. Besides…..lentils grow. I made 1/2 the recipe and I had enough lentils/veggies for a basketball team. I don’t enjoy lentils as much as you do but I could be won over. Especially if duck is involved! Early morning boot camp is the exercise class I go to 2 mornings a week at 6am, outside, rain or shine, from April through November. We meet on one of the town’s playing fields. The guy who runs the program is a former gym teacher, and anyone can do it. I am not an athlete nor are most of the women in the program (there are about 30 of us). Everyone seems to push themselves the right amount. This is my 6th year doing it, and it’s changed my life. I love it, and wouldn’t dream of sleeping in and missing it. Betsy, gorgeous lake indeed! An early morning hike sounds like something I would really enjoy too – especially when the surroundings are that beautiful! And your lentils with the chopped vegetables sound delicious – very comforting dish to serve. Nice pairing with braised kale, beet salad (love the earthy taste of beets) and duck confit (delicious!). Betsy, Gorgeous photo of the lake! I love early morning walks when I’m at the beach. I usually get out before the sun, so that I can watch the sunrise! At home, I walk everyday with several friends in my neighborhood. Your boot camp sounds like enjoyable hard work! I felt the same way about cooking the lentils as you. I couldn’t taste the brandy and I saw no need for the second boil. Love the way you served them…a fabulous meal with the duck! Have a great weekend!! Being a vegetarian at heart I would never think of serving lentils as anything but the main course, but your meal is fabulous. The oilness of the duck and the earthy bitter and sweet vegetables…knock out. As for this recipe, I found the preparation fussy. If you make it again I hope you try my simple approach. You don’t loss the brandy flavor and it’s just easier. Good to know I wasn’t missing out by forgetting the brandy. I liked these. Your meal looks delicious, restaurant ready. Summer is still blazing in California but I am looking forward to autumn. Nice hike. I admit that I was a tad skeptical of the pre-cook step for the lentils and I’m not sure that I would do it again. Though, maybe I need to do a side by side comparison before I dismiss it entirely. Gorgeous morning hike. I’m no morning person, but I’d get out of bed for that. That early morning lake scene reminds me of the summer I spend at the lake district in Canada! I went with the pre-cook step and the rest of the recipe to the T with the exception that I cannot find my stash of clove! A splash of brandy at the end with chopped spring onions worked well for me! Beautiful lake, worth an early morning! I love that you served this with duck confit, it highlights the (deceptive) sophistication of these lentils. Those mountain views are almost always worth the effort it takes to get them, aren’t they? It has been a little too hot in the desert for lentils, but this is definitely on my list to make-up. Lovely lake and mountain view!